Sadhana USA's mission to combat childhood obesity and bring balance and contentment to families, takes us to the front lines of a segment of our society that continues to grow and can be as much a part of the solution as it can be the problem....Youth Sports. 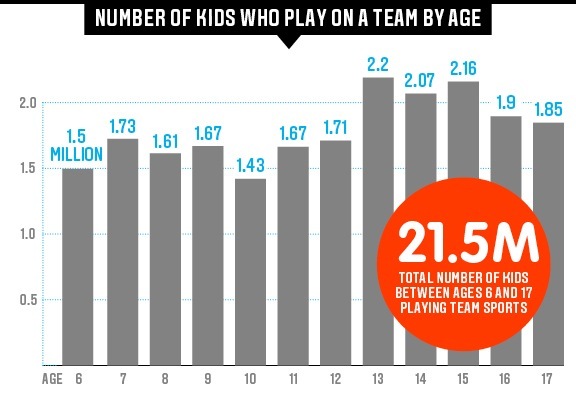 Families continue to enjoy the experience of youth sports at all ages. Sadhana USA wants us to begin to understand what these experiences do and do NOT deliver. Sports and Fitness Industry Association has done research that projects that 21.5 million youth participate in sports. Other researchers put this number closer to 30 million. 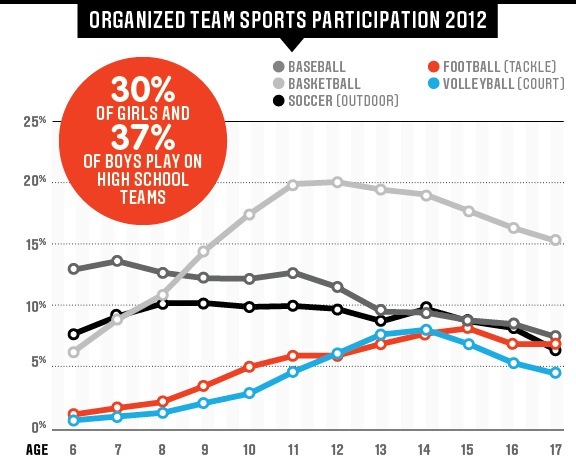 The follow graph shows participation in different sports by age. The experience of youth sports can help children understand the rules of the game they play, increase social skills, provide opportunites to learn and apply values of discipline and persistence. However in many sports, the bulk of practice time is instructional and not physically active. "Long-term, the nation's biggest health concern remains obesity. And despite all the youth leagues, the waistlines of America's children are growing. According to the latest CDC numbers, 16.9 percent of kids were obese in 2009-10, almost triple the rate of 1980. According to the CDC, overweight children have a 70 percent chance of becoming overweight adults. By 2030, the CDC predicts that 42 percent of all American adults will be obese. Sadhana USA participates in youth sports but does so with different programs and practice plans in an effort to retain the traditional benefits of youth sports while expanding benefits by providing more fitness training, respect for family time and professional coaches that have a passion for utilizing their sport to teach their athletes life skills.